As I shared in my brutally honest post earlier this week, one of the layers of chaos in our life has been remodeling our third floor. From the beginning, we loved the potential it had because of the full staircase already in place, and the roofline of our 1940 colonial makes for a dramatically magical space. Even better, there was a decent amount of old cedar planking already up there, so we capitalized on that… I can’t wait to show you. Tell me, which of these features or combinations stands out to you? Do you have any other amazing inspiration pictures for my attic bedroom/bonus room? Send them my way! It’s not beautiful (yet, hopefully) but we remodeled our upstairs a couple years ago. http://thebrickbungalow.blogspot.com/search/label/upstairs%20remodel the previous owners made it a master suite but it lacked proper insulation and made it unbearable. We added spray foam, giving us plenty of insulation without taking much away from the limited head room. Unfortunately, we did cover up the old brick walls but to make it well insulated, it had to happen. I’ve been working on it since, trying to decorate my office, make our closets work the best way possible, add a sitting area, and so on. Good luck with yours! I would not be much help in helping you select … All the attic bed rooms are lovely … Good luck. Love your new picture on the sidebar. I love them all! We just added onto our house and have a new master bedroom, we had the plans drawn up so that it’s vaulted and then hubby and I nailed up planks and painted it white! I love it, so glad we did it! Thanks for your lovely inspiration. Thanks, Heather! I love the planked look; I bet your new master is lovely! Enjoyed seeing your inspiration photos. We live in a 1930s home, and when we bought it in 1995, the attic space was floored with stairs already in place. Our first thought was why no one had finished out the space as living area. My husband immediately saw the potential with the high pitched roof and large area which is now our master, bath, utility room, and my office. 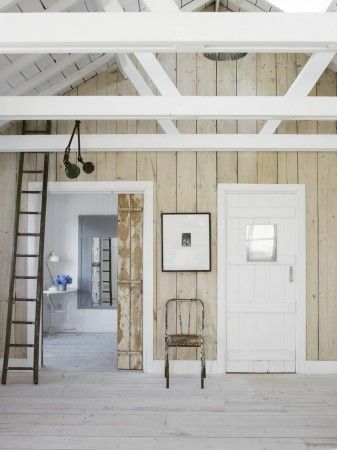 It’s a favorite part of our house because of the quaint wall and roof line that forms the room. We even have dedicated attic space that we didn’t finish out. I’ll be eager to see your finished space. Good luck with your project. It sounds like your attic area is just perfect, Sarah. 🙂 Ours is not that big, but I hope to gain the same functionality from our little space. Thank you so much for sharing! 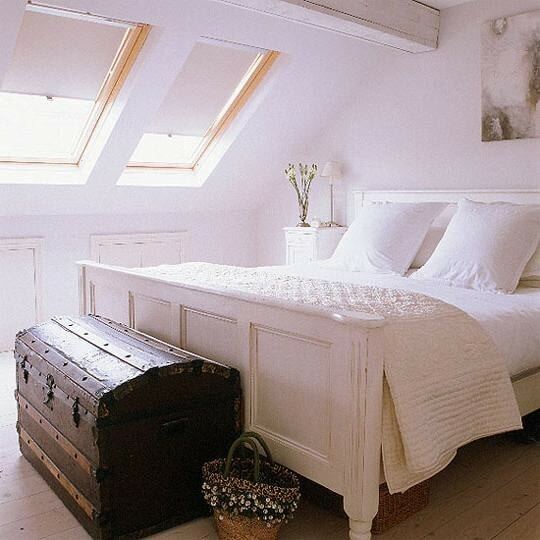 Perfect inspiration for me who happen to have my bedroom in the attic. Wow! I can’t believe you are going to get to have a space like that in your home someday. I love the first photo. 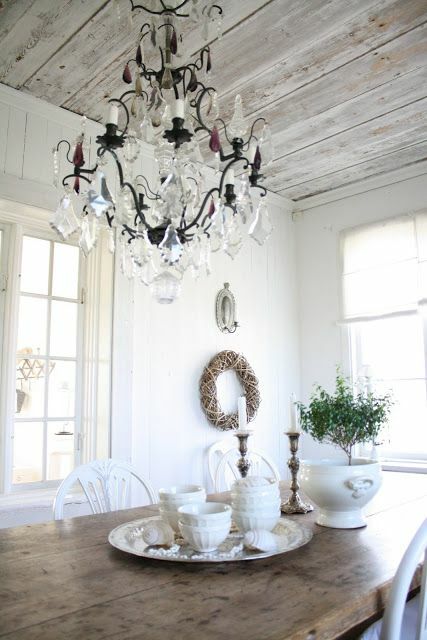 All of the white with the dark floors is beautiful. Love those spaces. Oh my gorgeousness these are totally romantic! I love them all!!! NEED! Yes! 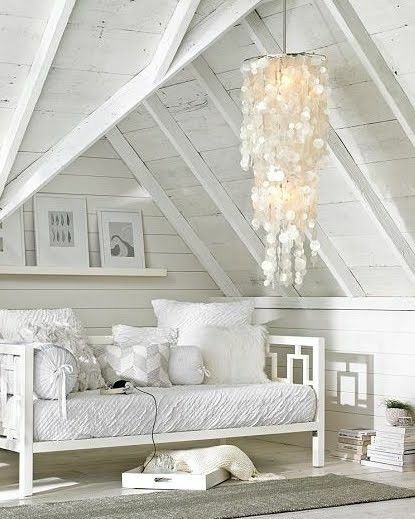 Dreamy romantic attic rooms, what a wonderful collection. Rachel how beautiful. Each room has its own personality but they come together so perfectly. Question….. 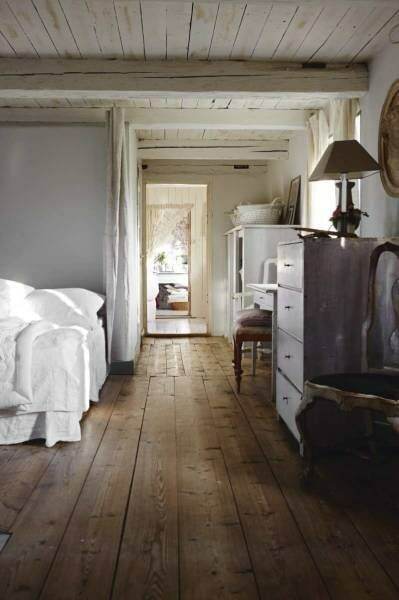 The “medium brown floors” are beautiful in the attic bedroom. We are diy wide plank flooring in our bedroom and I am having a heck of a time findings stain that isn’t too yellow or too dark, would you know what stain was used? I sure would love to know. Hi Laurie, I’m so glad you like the rooms! Unfortunately, I found the image on Pinterest and was unable to find the original source. I’m so sorry! But the color is perfect, isn’t it? Good luck with finding the right shade for your bedroom!